After that extended and unexpected hiatus, I thought I'd throw out an update with a few mini reviews. Here are the products I've finished in the past few months. Crece Pelo Natural Phitoterapeutic Treatment: This is a good deep conditioner, but last year I realised there are two different formulations available. I prefer the one without cones. I haven't seen this in the UK, so I doubt I'll be repurchasing anytime soon. Curls Coconut Sublime: I didn't like this conditioner; it did nothing for my hair. Not enough moisture and not enough slip. These are two of the main properties I look for in conditioners and it didn't do either for me. Definitely not a repurchase. 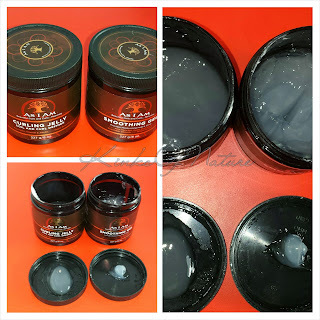 Dirty Works Supreme Cream Body Butter: This is a UK-based brand. To me, it seems like they're fashioned after Soap & Glory. This product is reminiscent of Soap & glory's Righteous Body Butter. The consistency and fragrances are very similar for both products. I've gone through 2 jars of this. Honestly, I mainly buy it for the fragrance. It does have emollient properties; my skin feels extremely soft after application. However, it isn't moisturizing enough for my skin. I have to apply it several times or layer it with other products. I'd probably repurchase this eventually. It's less than half the price of Righteous Body Butter and the main ingredients are more towards the natural side. Karen's Body Beautiful Moisture Mist: It's ok, It's not terrible, but it isn't amazing either. I won't be repurchasing this product. The good thing about KBB, though, is that they have a selection of fragrances so if you like a product, you aren't stuck with a fragrance you hate. Most companies don't give you fragrance options. Shea Moisture Coconut & Hibiscus Curl Enhancing Smoothie: I noticed while unpacking that this had separated so into the trash it goes. I had less than half left so it's not too much of a loss. I have't been using it very much lately, but it's one of those products I always keep in my stash. I still like it, but I have better products that function in the same way. I'm not sure if or when I'll be repurchasing this, but I'm not countig it out completely. Soultanicals Can't Believe It's Knot Butta: This arrived separated and remained separated. No amount of mixing ever fixed it. I can't even judge this product because it's not what it's supposed to be. Not a repurchase. This was a huge disappointment. Tigi Moisture Maniac Conditioner: This was my favorite conditioner. I'm sad to have finished my last bottle. It's the best I've ever used, but unfortunately, it was discontinued a few years ago. I'll probably use Tresemme Naturals or Herbal Essences conditioners now. Wetline Xtreme Gel: This is a firm hold gel. I've used it on wash and go styles and for sleek buns. My hair will be smooth and defined, but it can be hard/crunchy if I don't have a heavy moisturizer underneath. It takes a lot of effort to soften the hold of this gel. I have to prepare my edges for using this gel, or they'll be extremely dry and the strands will break easily. Using a heavier leave-in and doing a light and quick rinse after applying the gel helps soften my wash and go. I also have to be diligent about applying a moisturizer in the morning and evening. Wetline Xtreme Gel gives me the most hang time out of any gel I've tried so far. I do think I'll repurchase, but I'm moving away from using gels on my edges because it's just too harsh.